Green Valley is situated on Highway 34 between Lancaster to the South & Alexandria, Ontario to the north. Highway 34 divides the county basically down the center. Green Valley is just north of the 9th concession of Charlottenburg & the 8th concession of Lancaster in the township of South Glengarry. 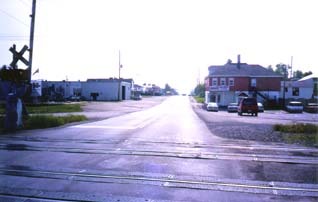 Building on centre right is Viau's Ladies Wear and across the street, left side is the garage of Glengarry Aggregate, formerly Menard's Gravel Company.